The 1980s was an interesting decade for fantasy films because it came along during the early days of the blockbuster era. After the success of Star Wars and Raiders of the Lost Ark, studios were offering big budgets to movies that used to be considered second-tier releases. They came before the rise of CGI, so even the expensive special effects are hokier. 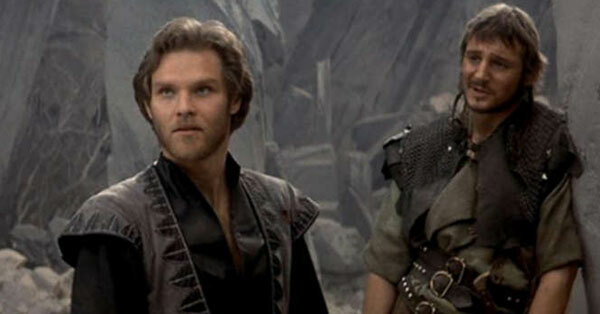 Compared to gargantuan franchises like the Lord of the Rings and Harry Potter films, movies like Krull look ridiculous. On the other hand, there is less on the line financially (relatively speaking), so the creators have more leeway. This approach may not draw crowds, but it creates a staying power to build a cult following. Does Krull deserve its acclaim as a B-movie gem? Let's check out the questions to find the answer! On the planet of Krull, the Beast has invaded the land, and its Slayers are killing everything. Their technology is stronger than swords, and there's little Colwyn (Ken Marshall) and the kingdom's armies can do when the Slayers invade the castle. His new bride Lyssa (Lysette Anthony) is captured by the evil minions, so he embarks on a daring quest to save her and their land. A band of misfits joins his mission, which has little chance of succeeding. The main problem is finding the Black Fortress, which moves frequently around Krull and may never be located. A prophecy has declared that Colwyn and Lyssa's son will rule the galaxy, so the stakes have never been higher for this impossible venture. We're seeing the land of Krull in a dire state, so I wouldn't want to reside there during that time period. There are lots of nasty obstacles to face, including a hungry spider, deadly quicksand, and the minions of the Beast. The Slayers can fire lasers that easily dispatch their opponents, so fighting them with old-school weapons seems like a painful idea. Most of the people seem friendly; even criminals like Kegan (Liam Neeson) and Rhun (Robbie Coltrane) are pretty nice guys. Once the Beast is gone, Krull could be a good place to live. There's plenty of open land populated by very few people, so it should be cheap. It seems pretty barren, but life's bound to improve with Colwyn in charge. I'm not sold on his queen yet, but she does receive pretty limited screen time. Three-dimensional characters are not Krull's strong suit. Colwyn is nice and capable, but it's a one-note role. He loves Lyssa and has to find her, and that's about it. She's trapped in the outlandish Black Fortress and just wants out of there. While that motive is understandable, it's hard to care. Secondary characters are more enjoyable because they're such oddballs. The prime example is Ergo "the Magnificent" (David Battley), a minor wizard able to turn people into animals. He ends up being the victim of most of the spells, which go wrong at the last second. Colwyn's main guide on this journey is the wise Ynyr (Freddie Jones), who leads him to the Glaive, a powerful artifact that's laughably easier to discover. Once he dodges some falling rocks, Colwyn just needs to stick his hand into some fire and the Glaive is his. Ynyr oversells the danger of this feat, but he brings weight to other actions that would be even sillier without his involvement. While it might be a stretch to call the special effects amazing, there is plenty of inventive set design. The highlight is the surreal Black Fortress, which includes giant teeth and eyes that somehow are connected to a larger entity. It's not clear how it all comes together, but the effect is both haunting and over the top. The $27 million budget was no joke in 1983, and the money is up there on the screen. The make-up effects like the cyclops above are goofy but don't take us out of the movie. When the story concept is already ridiculous, it's wise to just go with the flow and enjoy it. Less inspiring is the brutally long scene involving quicksand that goes on for an extended period of time. Eventually, I was just ready for the weak guy at the end of the line to let go and disappear. Krull follows the typical three-act structure, with the Slayers appearing whenever the action gets too slow. One of the oddest scenes involves Ynyr visiting the Widow of the Web (Francesca Annis) in a last-ditch effort to discover the Black Fortress' location. She lives inside a spider web (making the name accurate) and has grown old, but seeing Ynyr brings back memories of their young love. This entire interlude comes out of nowhere, especially when you add the nasty spider that guards the web. If Ynyr is going to find the information, he may not survive to see the journey's end. Another goofy moment involves a girl that the Beast sends to tempt Colwyn away from Lyssa. This girl is terrible at seduction, and he doesn't seem to get the gist for most of the attempt. The Beast really needs to hire better people. He shows the video to Lyssa, and she quickly realizes there are no worries in this area. I also have to mention Liam Neeson and Robbie Coltrane in early roles as the criminals. Both get the chance to utter a silly quip during their death scenes, but Coltrane outdoes Neeson with a ridiculous hair cut. Sorry Liam; you lose this battle. Although it pulls from a variety of other material, I'll admit that Krull is a unique movie. Director Peter Yates isn't a master at shooting action scenes, but he chose the right people for the set design and visual effects. Unlike Legend, this movie never takes itself too seriously, and there's the sense that everyone's just having fun playing with toys. Marshall and Anthony are pretty dull, but there's so much going on around them that it doesn't hurt the story too much. I haven't even mentioned the super Clydesdales that run on fire and fly across the night sky. Now I understand how Budweiser can charge so little for its crappy beer. It's not a complete success, but there's enough light-hearted entertainment to make it a fun two hours. This is the perfect movie to watch as a group and enjoy the mayhem. Next week, I'll close out the Once Upon a Time Marathon by heading back to 1926 for the silent film The Adventures of Prince Achmed. 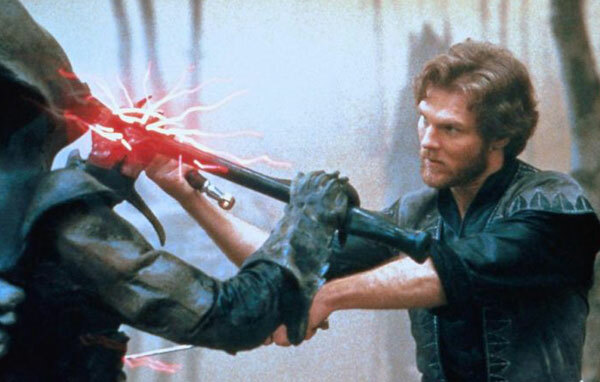 I had only heard of Krull because I read a few interviews w/ Gerard Butler where he talked about this movie. He was about 15 when he saw it and he had a dream he was living in the movie. It actually made him want to go into acting, ahah. I might watch this one at one time, I quite enjoy fantasy movies. Interesting about Gerard Butler. 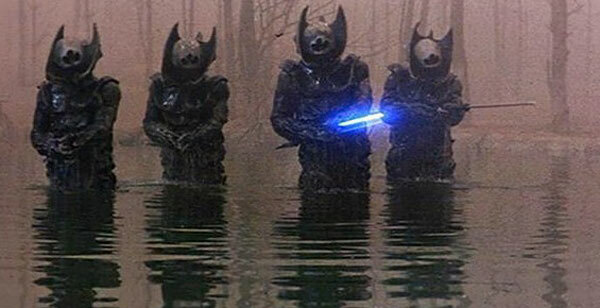 Krull is a really odd film. I can't say for sure that it's good, but it's a unique experience. Thanks Ruth! Can this be compared to ' Flash Gordon' in anyway? I enjoy that film for what it is and this looks like the same sort of idea. Max, I think there's a connection, but they're pretty different. Flash Gordon is cheesier and more fun, while Krull is stranger. Both have their odd moments, so I do see a similarity, though I wouldn't expect any football matches with the villains like in Flash Gordon.